Oh, does that piece of canvas bring back memories. Stacking the "Journal" on end, you could get about 30 papers in that thing, excluding the Sunday Edition. The flap did a pretty good job keeping the rain and snow off the papers. The kid carrying it, well, you just suffered. Tilted 20-degrees to off-set the weight imbalance while walking, you'd trudge up walkway that had not yet been shoveled clear of snow. And customers always wanted their paper INSIDE the storm door--none of this tossing the paper on the porch from 15' away. All that service for a subscription fee of 40-50 cents per week. For me, and many other paperboys, it was our first job and we learned quickly about money management customer service. I shared a route with another guy for awhile — Greenway and a section of Forest Hill. Definitely not a job where you want to break down how much you are actually making per hour. Too depressing. But it was a lot of responsibility and you had to collect payment, which is not easy. The idea of sending a young one to a stranger's door to collect money just horrifies me now. My how times have changed. I wore out a few of those bags. I had a route for about 5 years with just over 100 customers on Copeman and Emerson. I remember walking through plenty of snow at times, and the challenge of collecting, but it was all worth it when I was able to buy my own Adidas during high school. My parents were only going to pay for Converse All Stars. Most of my customers were pretty decent, but I had a couple of them who would be calling my house if they didn't have their paper by 5:00. My Journal route was definitely better than the Free Press route I started with, since I had less than half as many customers and I had to cover a 12 block area. Oh yes, inside the storm door they wanted it. I had a neighborhood that wanted that too. 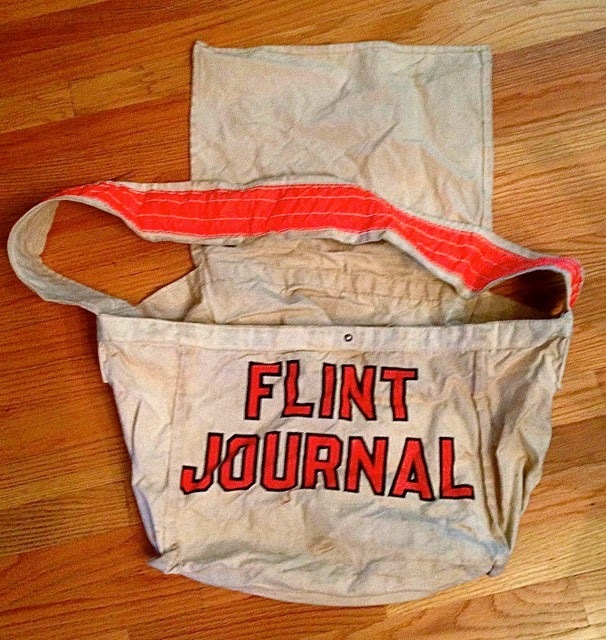 My brother and I were Flint Journal paper boys around '67-'69. We delivered some pretty historical news during that time like the Vietnam War Tet Offensive, MLK and RFK assassinations, and the Apollo moon landing. We usually made about $20 a week to split. Same here we used to make close around $100 each in Christmas tips. Not really a lot of money these days but back then it went a long way. Hated those Sunday papers and Thanksgiving with all the ads.